In rodents and humans, the rate of beta cell proliferation declines rapidly after birth; formation of the islets of Langerhans begins perinatally and continues after birth. Here, we tested the hypothesis that increasing levels of E-cadherin during islet formation mediate the decline in beta cell proliferation rate by contributing to a reduction of nuclear β-catenin and D-cyclins. We examined E-cadherin, nuclear β-catenin, and D-cyclin levels, as well as cell proliferation during in vitro and in vivo formation of islet cell aggregates, using β-TC6 cells and transgenic mice with green fluorescent protein (GFP)-labelled beta cells, respectively. We tested the role of E-cadherin using antisense-mediated reductions of E-cadherin in β-TC6 cells, and mice segregating for a beta cell-specific E-cadherin knockout (Ecad [also known as Cdh1] βKO). In vitro, pseudo-islets of β-TC6 cells displayed increased E-cadherin but decreased nuclear β-catenin and cyclin D2, and reduced rates of cell proliferation, compared with monolayers. Antisense knockdown of E-cadherin increased cell proliferation and levels of cyclins D1 and D2. After birth, beta cells showed increased levels of E-cadherin, but decreased levels of D-cyclin, whereas islets of Ecad βKO mice showed increased levels of D-cyclins and nuclear β-catenin, as well as increased beta cell proliferation. These islets were significantly larger than those of control mice and displayed reduced levels of connexin 36. These changes correlated with reduced insulin response to ambient glucose, both in vitro and in vivo. The findings support our hypothesis by indicating an important role of E-cadherin in the control of beta cell mass and function. The online version of this article (doi: 10.1007/s00125-012-2824-6) contains peer-reviewed but unedited supplementary material, which is available to authorised users. Relative or absolute deficiency of pancreatic beta cell mass underlies the pathogenesis of type 2 and type 1 diabetes . Among the factors affecting postnatal beta cell mass (i.e. beta cell proliferation, beta cell size, beta cell apoptosis, islet cell transdifferentiation and islet neogenesis) , proliferation is considered to be quantitatively the most significant in both humans and mice [3, 4]. In each species, the rate of beta cell proliferation declines after birth [2, 3], reflecting a decrease in the number of cells going through the G1/S transition [5, 6]. Genes that control this transition, such as cyclin D1/D2 and Cdk4, influence beta cell proliferation in mouse models . In murine islets, cyclin D2 shows the highest levels compared with other D-cyclins, and plays a primary role in regulating postnatal beta cell mass . From postnatal (P)4 to P10, the percentage of beta cells producing cyclin D2 is reduced threefold, but how and why this decrease occurs is unknown. In mice, formation of the islets of Langerhans begins at embryonic day (E)17.5–E18  and continues after birth until at least P13 . We hypothesised that the cell adhesion molecule, E-cadherin, might be upregulated in response to the cell–cell contacts that beta cells establish during islet formation, contributing to the reduction of cyclin D2, and consequently slowing beta cell replication. E-cadherin is produced endogenously by beta cells, and mediates most of the Ca2+-dependent cell adhesion between all islet cell types . Overexpression of a dominant-negative form of E-cadherin in beta cells disrupts islet formation at E17.5 , and antibodies against E-cadherin prevent pseudo-islet formation in MIN6 cells . E-cadherin has been reported to modify wingless-type MMTV integration site family (Wnt) signalling by tethering β-catenin to the plasma membrane, inhibiting its translocation to the nucleus and thereby decreasing levels of D-cyclin . We also tested the effect of E-cadherin on insulin secretion, as the levels of E-cadherin at the beta cell membrane correlate with insulin secretion  by a still-undetermined mechanism that likely involves changes in the gap junction protein connexin 36 (CX36) [15, 16, 17]. Here, we report that: (1) the levels of E-cadherin protein increase during pseudo-islet formation in vitro and islet morphogenesis in vivo, in parallel with a decrease in the levels of D-cyclin; (2) loss of E-cadherin production in beta cells, after conditional knockout, is associated with increased beta cell proliferation and beta cell mass; and (3) the increased mass of beta cells resulting from loss of E-cadherin expression is associated with reduced glucose-stimulated insulin release both in vivo and in vitro, consistent with the parallel downregulation of CX36. For details of tissue culture, pseudo-islet formation, and transfection for β-TC6 cells, see the electronic supplementary material (ESM) Methods. The preparation of Ins2-Gfp knock-in mice, generated to label beta cells with green fluorescent protein (GFP), is described in the ESM Methods. To generate beta cell-specific E-cadherin knockout mice, Ins-Cre mice on a Black Swiss background  were crossed with mice with LoxP sites flanking exons 6-10 of E-cadherin (B6.129-Cdh1 tm2Kem/J, Ecad [also known as Cdh1]fl/fl ; Jackson Laboratories, Bar Harbor, ME, USA). See the ESM Methods for further details. Paraffin sections or cryosections of pancreases were prepared using standard techniques. Histological sections and antibodies used for each histology analysis are described in the ESM Methods. Proteins were extracted using mammalian protein extraction reagents (M-PER) or nuclear and cytoplasmic extraction reagents (NE-PER) (Fisher, Waltham, MA, USA) from whole-cell extracts and purified cytosolic and nuclear fractions, and assayed as described previously . See the ESM Methods for further details. Total RNA from β-TC6 cells and isolated islets was extracted using the RNeasy kit (Life Technologies, Carlsbad, CA, USA) and cDNA was prepared using SuperScript III (Life Technologies). See the ESM Methods for further details of chromatin immunoprecipitation (ChIP) assay, quantitative PCR and primer sequences. Cell proliferation was assessed by the following methods: (1) 5-ethylnyl-2′-deoxyuridine (EdU) incorporation, using the Click-iT EdU Flow Cytometry Assay Kit (Life Technologies); (2) fluorescein succinimidyl ester (CFSE; Life Technologies) labelling; (3) BrDU incorporation, quantified using a BrdU ELISA kit (Roche, Indianapolis, IN, USA); and (4) Ki67 immunostaining of primary beta cells. See the ESM Methods for further details. β-TC6 cells were co-transfected with small interfering (si)RNA against E-cadherin, and with either a green or red fluorescence siGLO Transfection Indicator (Fisher), as described above. After 3 days, cells were either tested by microinjection of ethidium bromide or Lucifer Yellow to assess the functions of CX36 channels, or FACS sorted and then extracted for protein analysis. Detailed methods are provided in the ESM Methods. Male mice homozygous for the Ins2-Gfp allele were crossed with female C57BL/6J mice. Pancreases of mice at different ages were dissociated into cells as previously described  to quantify E-cadherin and cyclin D1/D2 per beta cell. See the ESM Methods for further details. Pancreatic perfusion, islet collection, and glucose-stimulated insulin secretion (GSIS) were performed as previously described . Media insulin concentration and the insulin content of the islets were measured using an ultrasensitive mouse insulin ELISA (Mercodia, Uppsala, Sweden). Islet insulin release was expressed in relation to islet insulin content. Islet glucagon concentration was measured using a rat glucagon ELISA (Wako, Richmond, VA, USA). Islet morphometric analysis was performed as described by Dokmanovic-Chouinard et al . The insulin-positive area was quantified using ImageProPlus software version 6.3 (Media Cybernetics, Bethesda, MD, USA) and Photoshop CS2 (Adobe, San Jose, CA, USA). Beta cell mass was obtained by multiplying the total pancreas mass (mg) by the mean proportion of insulin-positive area per section and area. The platelet/endothelial cell adhesion molecule 1 (PECAM)- and cadherin 5, type 2 (vascular endothelium) (CDH5 [VE-cadherin])-positive area was expressed as a percentage of total insulin-positive area. Batches of 20–30 islets isolated from four control and four beta cell-specific E-cadherin knockout (Ecad βKO) mice were processed as described in Stefan et al . Some experiments also investigated control and Ecad βKO islets in situ, after similar processing of fragments of intact pancreas (three mice per group). Three to five islets were screened per animal, and about 50 isolated beta cells were screened (three mice per group), under blinded conditions, for potential differences in intercellular junctions between control and Ecad βKO mice . Organelles were identified as previously reported [22, 23]. For studies of glucose homeostasis, intraperitoneal glucose tolerance tests (IPGTTs), capillary blood glucose and serum insulin assays, and insulin tolerance tests (ITTs) were performed. See the ESM Methods for further details. Student’s t tests (two-tailed) were performed using Microsoft Excel (Office 2007 and Office 2010). A p value <0.05 was considered significant. To assess the effects of aggregation of insulin-producing cells on their proliferation, we generated in vitro islet-like aggregates (pseudo-islets) using SV-40 transformed insulinoma β-TC6 cells. See ESM Results for details. In β-TC6 pseudo-islets, the amount of E-cadherin correlated negatively with the levels of cyclin D2 and cell proliferation rates (ESM Fig. 1a–f). Monolayers of β-TC6 cells treated with an siRNA that reduced Ecad mRNA by 90% showed increased cyclin D1 and D2 mRNA and cell proliferation (ESM. Fig. 2a–d). Chromatin immunoprecipitation (ChIP) in cells stably overexpressing E-cadherin showed decreased levels of β-catenin binding to the promoter regions of both cyclin D1 (−50%) and c-Myc (also known as Myc) (−40%), compared with β-TC6 cells stably transfected with an empty vector (ESM Fig. 2). These observations indicate that the change in beta cell proliferation induced by E-cadherin may be mediated by alterations in the binding of β-catenin to several target genes. We generated a mouse co-expressing gfp and Ins2 by homologous-recombination-mediated knock-in of the fluorescent protein at the Ins2 locus (Fig. 1a). The immunoblot of proteins extracted from islets of homozygous and heterozygous Ins2-Gfp mice with an anti-GFP antibody showed a 27 kDa band that was not detected in wild-type (WT) control mice (Fig. 1b). Nearly all (96%) of the insulin-positive beta cells of the Ins2-gfp homozygous mice showed GFP labelling (Fig. 1c). GFP was not detected in the brain, kidneys or liver (data not shown). At 1.5 months of age, both homozygous and heterozygous Ins2-gfp mice had normal glucose tolerance (Fig. 1d). The levels of E-cadherin per beta cell increased approximately twofold between birth and P22, remaining constant thereafter, while no such change was observed in non-beta pancreatic cells (Fig. 1e). The mRNA levels of cyclins D1/D2 decreased in parallel between P0 and P45 in FACS-sorted beta cells (Fig. 1f). Compared with the levels observed at birth, the levels of cyclin D2 were reduced by 65% and 82% at P22 and P45, respectively. Transcript abundance of cyclin D1 was ten- to 100-fold lower than that of cyclin D2 , making it difficult to detect decreases in cyclin D1 levels. At P1, almost all beta cells in C57BL6/J animals displayed nuclear staining for β-catenin. As the mice aged, the proportion of beta cells with such staining decreased and nuclear β-catenin was not detected in beta cells at P90 (Fig. 1g). These experiments indicate that, during postnatal in vivo islet formation, E-cadherin abundance is negatively correlated with levels of D-cyclins and nuclear β-catenin. To examine the effects of E-cadherin on beta cell proliferation, we generated mice lacking E-cadherin in beta cells by crossing Ins-Cre recombinase mice  with Ecad fl/fl mice . Immunofluorescence staining of pancreatic sections indicated that E-cadherin was not detectable in beta cells of Ecad βKO mice (Fig. 2a). A threefold reduction in E-cadherin protein was consistently observed in the islets of Ecad βKO animals (Fig. 2b). Immunohistochemistry indicated that the residual amounts of E-cadherin immunoblotted in the islet extracts (Fig. 2b) could be attributed to modest expression in non-beta cells in which Ins-Cre did not excise the targeted region of the E-cadherin gene (Fig. 2a). Body weights of Ins-Cre:Ecad +/+ (control) and Ecad βKO mice were not significantly different (data not shown). Islets of control and Ecad βKO mice did not differ in such ultrastructural features of beta cells as closely apposed plasma membranes (Fig. 2c), the mRNA and protein of beta cell maturation markers (data not shown), and the mRNA of 18 other cadherin species (data not shown). There was no visible change in either the configuration or number of alpha cells (ESM Fig. 3), nor was there a change in islet glucagon content ([mean ± SEM]: 1 month-old Ecad βKO mice 0.56 ± 383 nmol/μg of DNA; control: 0.54 ± 0.06 nmol/μg; n = 4 for each genotype), or mRNA of glucagon in islets (data not shown). However, Cdh2 and Cdh5 mRNA increased by nine- and fourfold, respectively, in the islets of Ecad βKO animals (Fig. 3a). Immunofluorescence revealed cadherin 2 (CDH2 [N-cadherin]) in the beta cells of Ecad βKO mice (Fig. 3b), whereas CDH5 was detected in the islet blood vessels of both Ecad βKO and control mice (Fig. 3c). CDH2 abundance was approximately threefold higher (3.0 ± 0.50, n = 3) in islets of 1 month-old Ecad βKO animals than in islets of age-matched controls (Fig. 3d). Consistent with the increased mRNA expression of Cdh5 in 1 month-old Ecad βKO animals, the area immunostained with CDH5 antibody was twofold larger in 1 month-old Ecad βKO animals than in control animals (Fig. 3e). Blood vessel density measured by percentage of area immunostained for PECAM within the insulin-positive area was increased approximately twofold in 1 month-old Ecad βKO animals (Fig. 3f), suggesting that the increased level of CDH5 can be accounted for by increased blood vessel density. These observations indicate that in vivo knockout of E-cadherin in beta cells did not markedly alter the organisation of beta cells within the islets, possibly because of compensatory changes in other cadherins. Immunoblots of islet proteins indicated that cytoplasmic β-catenin was detectable only in Ecad βKO islets, and that when these animals were 1 month of age, nuclear β-catenin was increased approximately ninefold (9.3 ± 1.0, n = 3) over control levels (Fig. 4a). In islets of 1 month-old Ecad βKO mice, cyclin D1 and cyclin D2 mRNA increased (p < 0.05) four- and threefold, respectively, vs controls (Fig. 4b). Cyclin D2 protein also increased in the islets of 1 month-old Ecad βKO mice (Fig. 4c). These results indicate that the increased beta cell proliferation in Ecad βKO animals was associated with increased levels of β-catenin and cyclins D1 and D2. To estimate the proportions of dividing beta cells, the number of Ki67-positive cells was related to the total number of insulin-positive beta cells . Ecad βKO mice showed higher rates of beta cell proliferation vs age-matched control animals. The percentages of Ki67-positive beta cells were 1.5-fold (p = 0.05) and twofold (p < 0.01) higher in 7 day- and 1 month-old animals, respectively (Fig. 4d). This difference did not reach statistical significance in 3 month-old animals (Fig. 4d) that showed an increase in beta cell mass (Fig. 4e). Although 1 month-old Ecad βKO and control animals have similar glucose tolerance (Fig. 5a), 3 to 4 month-old Ecad βKO mice showed reduced glucose tolerance (Fig. 5b), despite a 2.5-fold increase in beta cell mass and normal levels of several beta cell markers (Fig. 4e and data not shown). Area under the curve analysis confirmed the decreased glucose tolerance in 3 to 4 month-old Ecad βKO mice compared with control (Fig. 5c). No differences in insulin sensitivity (by insulin tolerance testing) and fasting insulin levels were apparent in either 1 or 4 month-old animals (Fig. 5d, e and ESM Fig. 4a). In mice at 1 month of age, the serum insulin concentrations after intraperitoneal glucose administration were not different between Ecad βKO and control animals (ESM Fig. 4b, c). However, 4 month-old animals displayed lower serum insulin concentrations at time point 15 min of the IPGTT (ESM Fig. 4d, e). 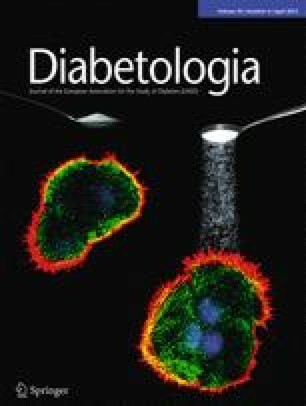 Islets isolated from 1- and 4- month-old Ecad βKO mice secreted 40% and 50% less insulin, respectively, (p < 0.05) in response to 8.4 mmol/l glucose (Fig. 5f, g). No difference was observed in the responses of these islets to 2.8 mmol/l glucose, 16.8 mmol/l glucose or 16.8 mmol/l glucose plus 20 mmol/l KCl (Fig. 5f, g). Under all of these conditions, islets of Ins-Cre mice displayed insulin secretion rates comparable with those of C57BL6/J controls (ESM Fig. 5). The insulin content of islets from Ecad βKO mice (1.7 ± 0.3 μg/g DNA) was not different from that of controls (2.0 ± 0.2 μg/g DNA). Response to ambient glucose is partly dependent on beta cell to beta cell communication mediated by gap junctions [24, 25]. In islets of Ecad βKO mice, there was an approximately 2.5-fold (2.4 ± 0.4, n = 2) reduction in levels of CX36 protein (Fig. 6a, b), a critical functional component of beta cell gap junctions [26, 27]. Three days after transfection of β-TC6 cells with an siRNA against E-cadherin, these cells, with an approximate fivefold reduction in E-cadherin levels (5.0 ± 0.22, n = 2), also showed an approximate fivefold reduction (4.7 ± 0.2, n = 2) in abundance of CX36 protein (Fig. 6c). Microinjection of two gap junction tracers, Lucifer Yellow and ethidium bromide , further revealed that the transfected cells containing reduced levels of E-cadherin were also significantly less coupled than cells that escaped transfection (Fig. 6d, Table 1). In mice and humans, beta cell proliferation rates decline postnatally and, at least in mice, this change is associated with a decline in the levels of cyclin D2 . However, the mechanisms that trigger these changes are still a matter of debate. The aggregation of endocrine cells in the proto-islet begins around E17.5, and islet formation continues in the neonatal period [9, 11]. Because of the highly ordered structure of the islets, the well-documented dependence of coordinated endocrine function on both paracrine and contact-dependent communication of the endocrine cells [25, 30, 31], and the role of E-cadherin in mediating relevant aspects of cellular architecture [10, 11], we examined the role of this cell adhesion molecule in the in vivo development and function of beta cells, with particular regard to their insulin secretion and rates of proliferation. We have found that the production of E-cadherin in beta cells increases both in vivo and in vitro with the formation of islet structures, and is accompanied by decreased levels of D-cyclin, and decreased beta cell proliferation. Our analyses of mice with a null beta cell E-cadherin allele (Ecad βKO), as well as of insulin-producing cells with reduced E-cadherin abundance through exposure to a specific siRNA, indicate that E-cadherin negatively regulates beta cell proliferation by reducing the levels of β-catenin in the nucleus, resulting in decreased D-cyclin levels. This inference is consistent with a scenario in which increased levels of E-cadherin, as a result of establishment of cell contacts during islet formation, contributes to the postnatal reduction in beta cell proliferation. Despite the loss of E-cadherin, beta cells retain apparently normal physical contacts with nearby cells within the islets of Ecad βKO mice. Whereas disruption of beta cell apposition has been reported to result from overexpression of a dominant-negative isoform of E-cadherin , after incubation of islets with antibodies to E-cadherin , or after knockdown of E-cadherin in MIN6 cells , others have found that beta cells could still adhere in clusters after reduction of E-cadherin by siRNA or short hairpin (sh)RNA [15, 16]. Presumably, these differences can be accounted for by differences in the residual levels of other cell adhesion molecules, the extent to which the level of E-cadherin is reduced , and by compensatory changes in the many proteins that participate in beta to beta cell contacts and adherence. Our data show that these proteins may include CDH2, a molecule that facilitates cell–cell adhesion , and CDH5, a class II cadherin that does not heterodimerise with type 1 cadherins such as CDH2. The changes in CDH2 were not observed in β-TC6 cells in which Ecad was reduced by siRNA, suggesting that these responses are highly dependent on the context of individual cell types. The increased CDH5 abundance in endothelial cells was associated with an increase in the density of the islet vessels and could conceivably contribute to the sustaining of normal architecture in Ecad βKO islets. The reasons for the increase in blood vessel density remain to be determined. In another system, the decrease in islet vascularisation observed as a result of reduced expression of Sorcs (also known as Sorcs1) was indeed accompanied by disruption of normal islet architecture . The apparently structurally normal islets of Ecad βKO mice contained a larger mass of beta cells than did the islets of control mice. This change was associated with an increase in the proliferation of primary beta cells, consistent with the increased rate of replication observed in β-TC6 cells after reduction of E-cadherin expression by siRNA. In rodents, most new islets form [9, 11] and increase in size  during the early postnatal period (P0–P22), during which time the levels of beta cell E-cadherin protein also increase as a result of the establishment of increasing numbers of cell-to-cell contacts within the forming islets . During this period the rate of beta cell proliferation also decelerates [5, 6, 29]. We found that the levels of cyclins D1/D2 in beta cells also decreased from P0 to P22, as did the proportion of nuclear to cytoplasmic β-catenin. The central question is whether these in vitro and in vivo changes in E-cadherin, β-catenin and cyclins D1/D2 are mechanistically related to the observed developmental changes in beta cell replication rates and function. The data are consistent with a scenario analogous to that of the canonical Wnt pathway , in which increased expression of E-cadherin decreases nuclear levels of β-catenin, resulting in downregulation of the key cell proliferation genes, including cyclins D1/D2. These changes would be anticipated to reduce beta cell proliferation, and this prediction was fulfilled by our experiments. Thus, reduced E-cadherin expression, as a result of exposure to specific siRNAs, was associated with increased proliferation of β-TC6 cells. Conversely, increased E-cadherin abundance in β-TC6 pseudo-islets was associated with reduced cyclin D2 levels and a reduced proportion of cells featuring detectable nuclear β-catenin. The latter observation was also made in primary beta cells during the formation of islets between P0 and P90. ChIP assays further showed that increased E-cadherin levels resulted in decreased binding of β-catenin to promoters of known Wnt targets, including cyclin D1 and c-Myc. Our data extend those of previous studies in which conditional pancreas-specific disruption of β-catenin resulted in decreased numbers of beta cells and total islet area at birth , whereas levels of a constitutively activated β-catenin in beta cells increased nuclear levels of β-catenin, resulting in increased cyclin D2 levels and beta cell proliferation . However, other studies testing the down- or upregulation of β-catenin expression have suggested that, under some circumstances, this protein may be dispensable for endocrine cell differentiation, proliferation and function . Presumably, differences in the timing and efficiency of the Cre recombinase-dependent activation of the different promoters (pancreatic and duodenal homeobox 1 [PDX1], regulation of phenobarbital-inducible P450 [RIP]), which were used in these studies, account for these somewhat different observations. It is equally possible that E-cadherin regulates beta cell proliferation by a variety of pathways, only some of which may be independent of β-catenin. We have observed, for example, that increased production of E-cadherin in pseudo-islets is associated with decreased expression of Ezh2 (data not shown), which encodes a transcription factor involved in the platelet-derived growth factor (PDGF) pathway that enhances beta cell proliferation . Whatever the mechanism(s), it is relevant that the increased beta cell proliferation and mass that we observed in Ecad βKO mice was not induced by increased insulin resistance, given that the sensitivity of these animals to an acute insulin challenge was unaffected throughout their postnatal life. Despite the increased beta cell mass in the islets of Ecad βKO mice, these animals were modestly glucose intolerant, as a result of reduced glucose-stimulated release of insulin by their islets. The mechanism of this unexpected functional defect remains to be determined. A discrepancy in insulin responses in 1 month-old Ecad βKO animals existed: normal in vivo and reduced in vitro. These results could reflect an experimental artefact and/or physiologically relevant compensations provided by the in vivo environment. One possible explanation for the discrepancy in insulin secretion in vitro vs in vivo could be that the increased number of blood vessels in vivo facilitated in vivo insulin secretion, compensating for a reduction in insulin secretion per beta cell (reviewed in Eberhard et al ). Our experiments show that the in vivo loss of Ecad was associated with a marked decrease in the CX36 protein, consistent with previous data obtained in an insulin-producing cell line . Given that our in vitro experiments further document that such a loss significantly reduced the functional coupling of β-TC6 cells, and that Cx36 (also known as Gjd2) coupling is implicated in the control of GSIS [17, 24, 26, 42], it is plausible that the secretory defects of Ecad βKO mice are at least partly dependent on loss of CX36 coupling. In addition, CX36 is required for the effects of the Eph-ephrin pathway on insulin secretion . Therefore, the decrease in insulin secretion in 1 and 4 month-old Ecad βKO animals could also be accounted for, in part, by the reduction in the stimulatory activity of Eph-ephrin pathway resulting from the reduced CX36 abundance as a consequence of loss of E-cadherin. Furthermore, the age-dependent phenotype of glucose intolerance observed in 4 month-old Ecad βKO animals could also be explained by the decreased stimulatory effect of Eph signalling on GSIS caused by ageing in addition to the increased metabolic ‘pressure’ on beta cells caused by increased body mass. Increased penetrance of knockout phenotypes with age is commonly observed . At any rate, the observation that the glucose intolerance and loss of glucose-sensitive insulin release became apparent only in adult mice suggests that the relevant mechanism becomes a limiting factor as metabolic demand increases. In summary, these studies provide evidence that E-cadherin plays a significant physiological role in the postnatal control of beta cell proliferation and function. As E-cadherin is also found in human beta cells , it is possible, if not likely, that the cell adhesion molecule also plays a similar role in human beta cells, thereby affecting susceptibility to diabetes. CDH1, which encodes human E-cadherin, is located at Chr. 16q22.1, a locus that has been implicated in susceptibility to type 1 diabetes . The authors thank: D. Accili (Department of Medicine, Columbia University, New York, NY, USA) and L. Sussel (Department of Genetics and Development, Columbia University, New York, NY, USA) for helpful advice throughout this project; A. Efstratiadis (Department of Genetics and Development, Columbia University, New York, NY, USA, currently at the Biomedical Research Foundation, Athens, Greece) for providing the Ins2-Gfp mice; D. Caille-Rigo (Department of Cell Physiology and Metabolism, University of Geneva, Geneva, Switzerland); S. G. Fischer for assistance in formatting figures and text; and R. Rausch (Department of Pediatrics, Columbia University, New York, NY, USA) for excellent technical assistance. This work was supported by NIH DK66518, 5P30DK63608, the Helmsley Trust and the Russell Berrie Foundation Program in Cellular Therapies of Diabetes. PM is supported by grants from the Swiss National Science Foundation (310000-109402, CR32I3_129987, IZ73Z0_127935), the Juvenile Diabetes Research Foundation (40-2011-11), and the European Union (BETAIMAGE 222980; IMIDIA, C2008-T7, BETATRAIN, 289932). All the authors have: (1) substantially contributed to the conception, design, acquisition of data, and analysis of data; (2) contributed to drafting the manuscript or revising it critically; and (3) approved the final version of the manuscript.